The Technology Is Now Available, but Should Your Business Use It? We are currently witnessing advancements in technology that are improving the way that we understand the human race and the world that we live in. This new technology brings with it ethical dilemmas that we need to grapple with. Specifically, we need to decide where the line should be drawn to distinguish what is ethical and what is not ethical. For example, although one company’s use of neuromarketing was very successful, it pushed the boundaries of business ethics. The way another business might use biometric feedback could possibly cross the line into unethical behavior. Keep in mind, these examples are taken from the business world. 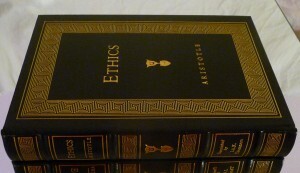 However, ethics need to be considered in all areas life. There are many definitions of business ethics. In fact, entire business/philosophy classes are offered to help people understand this subject. It is important to keep in mind that what the business thinks is ethical and what the rest of the world thinks is ethical might not always be the same thing. That is why public discussion and complete transparency are highly suggested and often required. It is also important to point out that if customers think something is unethical, then doing it could actually decrease sales and, thus, harm the business. For many years, companies have been using various market research techniques (e.g., surveys, focus groups, etc.) to gather insights as to what customers want and why in an effort to create better products or services and better marketing campaigns to sell those products or services. Beginning in the 1990s companies started to employ neuropsychology techniques to their market research in an effort to find out what their customers really want, sometimes even if they don’t know it. As a Fast Company article written in 2011 points out, many companies are using these techniques to help increase sales. Frito-Lay is one of these companies. According to a Gizmodo article, Frito-Lay did not stop there. The company’s website states that biometric market research uses fMRI, EEG, observational analytics, heart rate monitoring, and facial coding. We already know how an EEG can be used to create better advertising campaigns. If other ways of gathering biometric feedback are half as effective, many more companies will start to use these market research techniques in the future. It is therefore not surprising that Walmart filed for a patent that would allow the retailer to collect biometric feedback on shopping cart handles. People are already tracking a lot of this information on their fitbits and other smartwatches. While articles talking about this Walmart patent downplay the privacy issues, there certainly are a few. Although we might make some real gains in knowledge, we need to ask ourselves whether the tradeoff in privacy is worth it. In the first example, NeuroFocus used willing participants to gathered biometric data that allowed Frito-Lay and its advertising agency to create an ad campaign that was effective even when focus group respondents said that they hated it. If companies start to collect physiological responses to different stimuli, whether it be ads, physical retail environments, or anything else without customers knowing it pushes the ethical boundaries even further. Maybe too far. To determine where to draw the line, the business community should create ethical standards and follow them. If they don’t, laws will need to be created. Either way, it is important that people have discussions about what it going on so that we can ask ourselves whether or not what can be done should be done. Retail experts know that when customers use shopping carts in brick-and-mortar stores it increases the average number of items sold per transaction. It is therefore not surprising that stores are looking for ways to make the shopping cart an even more integral part of a customer’s shopping experience. Walmart is one of these stores. If you do a quick search online, you will see several of the patents that Walmart has filed in recent years involve ways of adding technology to their shopping carts. However, it was one patent that was filed in September of 2017 that really caught my eye. The patent allows Walmart to know when specific items are placed in a container. Although this patent doesn’t say that it will be used with a shopping cart, it could be. And, if used in conjunction with a customer’s smartphone, it could give Walmart the ability to recommend items that customers might want to purchase in a brick-and-mortar store in the same way that Amazon does when customers are shopping online. In other words, it would give Walmart the ability to use a recommendation engine to deliver suggestions to customers shopping in their brick-and-mortar stores. What Is a Recommendation Engine? Amazon and other online stores effectively use recommendation engines to increase sales online. However, offline it gets more difficult. With the exception of maybe Amazon Go stores, most stores don’t know what the customer is currently purchasing until they get to the cash register. And, once a customer gets to the cash register, it’s probably too late to get them to add another item unless it is being kept in a location nearby or the deal offered is really good. Currently, having customers talk to sales associates is the best and often only way for the store to suggestive sell add-on items to customers in a brick-and-mortar store based on what the customers are currently purchasing. Even if the customer is shopping with his or her smartphone in one hand, suggestive selling is limited to information collected from past transactions or online behavior (if the store has tracked that) and some demographic data. Mobile coupons, rebates, and targeted ads work, but again, there really isn’t a way to know what the customer is currently purchasing. That is, unless you use some sort of sensor to track them. That is why Walmart’s patent could be so valuable. 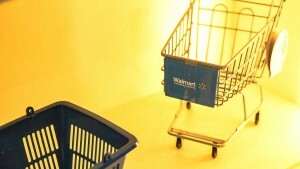 If Walmart develops the technology that they patented and puts it into a shopping cart, they would have the ability to know what customers are currently buying and could therefore send advertising messages to them that would recommend items that are often purchased with the customer’s current selections or that the customer might be interested in. Granted, this wouldn’t be the first time this was tried out. In 2012, Microsoft teamed up with Whole Foods to test a shopping cart that would help a customer be sure that they bought everything on their shopping list and even warned the customer that an item had gluten in it if the customer had let the system know that was one of the things that he or she was trying to avoid. It appears that the Microsoft/Whole Foods smart shopping cart didn’t make it past the testing phase. However, I think this was due to the fact that they tried too many things at once. In fact, some of the features seem to be solving problems that just don’t exist. It also might have been ahead of its time or just not a good fit for the brand. It might be some time before we see a shopping cart like the one described in this post. 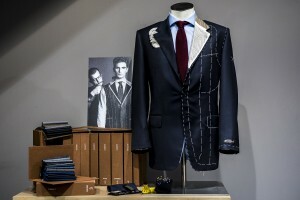 However, the store that finds a way to do it correctly will definitely increase sales. And, who knows, it could be another way for stores to sell paid contextual advertising to brands that are trying to reach customers in the offline world based on where they are, who they are, and what they are buying. As I mentioned earlier, Walmart has filed a patent that would make a very important part of the process possible. If there is a person in Bentonville who is working on a shopping cart that can do this, I’d love to write a post that gives more details. There are a lot of cool possibilities. And, if Walmart isn’t working on this or hasn’t thought of it yet, which I find hard to believe, please feel free to steal the idea. Or even better, contact me, as I have some additional ideas that might be useful. Cashless Stores: Ahead of Their Time or Just Bad for Business? 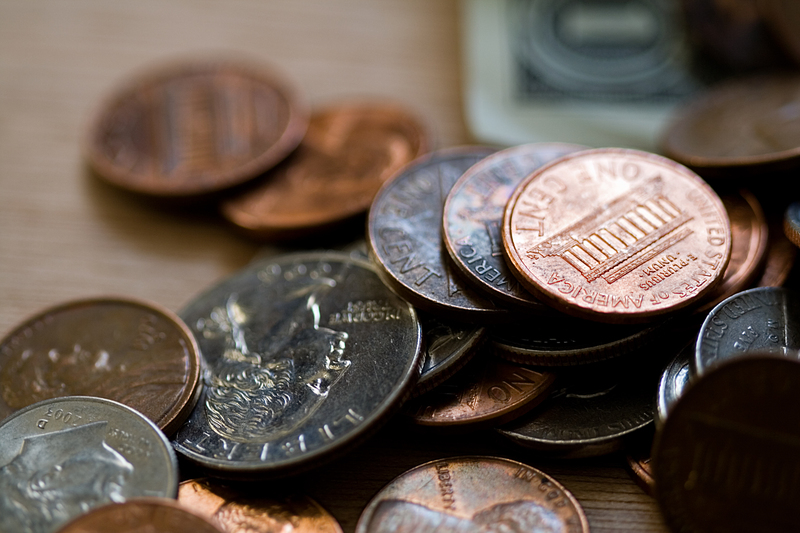 For years now, many experts have predicted the demise of cash. But even with more consumers adopting alternative ways to purchase items, it appears that cash isn’t going away anytime soon. In fact, this is something that Jeff Hasen, one the pioneers in mobile marketing, often points out on Twitter. A recent article on CNBC supports Hasen’s argument. “Cash remains the most frequent method of payment in the U.S., representing roughly 31 percent of consumer transactions, more than electronic, credit, debit or checks,” the author of the article writes. That said, this is not stopping some stores from trying to follow Amazon’s lead and eliminate cash as a payment option. I think that it’s good that stores are trying different things to see what works. However, as you might have expected, stores that try to go cashless are often met with some resistance. If you are not familiar with the AmazonGo cashierless store concept, the basic idea is that shoppers enter the store with a smartphone app downloaded to their phone, they scan their phones as they enter the store, they shop and leave with the items that they want to purchase without having to stop at a cash register. In this scenario, cash is not an option. While not going all the way to cashierless stores, other merchants are experimenting with the idea of eliminating cash in order to cut costs. While accepting cash as a payment option has been the norm for many years, accepting cash actually costs more than some of the other common payment options. A USA Today article highlights some of the expenses involved in processing cash transactions, as reported in an IHL report. “All told, such hassles cost retailers an average of 9.1 percent of sales, ranging from 4.7 percent at grocery stores to 15.5 percent at restaurants and bars, IHL says. That compares to the 2 to 3 percent transaction fees credit-card companies charge merchants,” the USA Today article reports. Therefore, it’s not surprising that some stores are looking to eliminate cash. But this has its downside. This is the main point of a recent article published on The New York Times website. According to the author, Ginia Bellafante, there are several arguments against going cashless. “The strongest objection relates to the ways in which rejecting physical currency plays out as a bias toward the poor; advancing segregation in retail environments,” writes Bellafante. When the article on The New York Times website was published, many people wondered if it was even legal to go cashless. Given this fact, it is not so surprising that lawmakers in New Jersey and New York City are trying pass bills to prevent stores from going cashless. 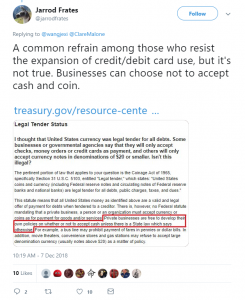 As an article on The Motley Fool website points out, New Jersey politicians are trying to prevent cashless stores because not accepting cash can prevent certain groups of people from making a purchase. This is the same argument that was made in The New York Times article mentioned earlier. According to The Motley Fool article, Massachusetts is currently the only state that requires brick-and-mortar stores to accept cash. Is Cashless Bad for the Brand? While it’s estimated that only 31 percent of consumer transactions are cash, not offering cash as an option can create hassles beyond the bad PR it is getting for creating barriers for the unbanked. Finding out that they can’t use cash until it is time to pay can be a source of frustration for some customers. 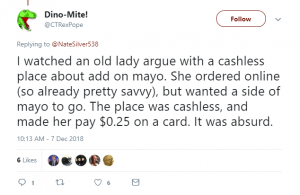 Even customers who rarely use cash can find it frustrating when they are asked to use a credit card to pay for a last-minute addition such as mayonnaise or another condiment at restaurants or even small items at a retail store. 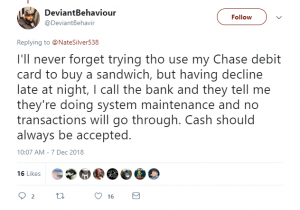 Given that customers can and often do vent their frustration publicly on social media, going cashless might be more trouble than it’s worth. 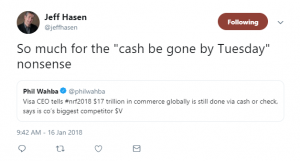 With this in mind, it is fairly easy to see why Jeff Hasen often reinforces the fact that cash isn’t going anywhere, at least in the near future. It is also not surprising that some merchants that tried to go cashless have decided to change their minds. However, as the author of the post on The Motley Fool website points out, while going cashless might not the best way to go now, stores will never know whether it is a good idea to go cashless in the future if they aren’t even allowed to try. It does seem like there might be some easy workarounds that stores or restaurants could offer if they do want to go cashless at the checkout line. The most obvious would be making an ATM or vending machine available to customers that would give them the option of buying prepaid debit cards. This would give customers access to the store, while still encouraging them to pay via other payment options. 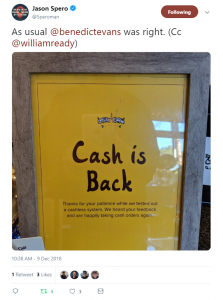 I’m not sure if this would satisfy lawmakers in Massachusetts, New Jersey, New York City, or any other place that makes going cashless illegal. If you know the answer to that legal question or if you have any other comments or suggestions, please feel free to comment below. “Fans of the late “Queen of Tejano” Selena Quintanilla caused the website of Texas-based supermarket chain H-E-B to crash after they released a limited-edition reusable shopping bag honoring the singer,” writes Thatiana Diaz in a March 9th post on people.com. H-E-B clearly hit a homerun when it teamed up with the Selena Foundation to sell a limited quantity of special-edition shopping bags that honored the late singer Selena Quintanilla. However, the real story goes beyond the fact that people waited in line to buy the bags or that the bags sold out so fast. The real win was all the earned media coverage that the brand received when fans of the singer posted photos of the bags online and the press covered the story after the bags sold out so quickly and caused the H-E-B website to crash in the process. In addition to the article on people.com, the story was covered on today.com, popsugar.com, retailwire.com, and on local news affiliates’ websites around the country. This definitely helped put the brand front and center, making it visible to a lot of potential customers. And, as most marketers know, the best thing a brand can get is a positive mention of the brand from a customer on social media, as friends and family are the best influencers out there. So, when fans went online in droves to post photos of the bags, as well as photos of the lines of people waiting to receive their bags, the retailer scored… big time! To see what people posted, search for #SelenayHEB or #Selenabag on Instagram, Twitter, or Facebook. My daughter got some gold today. She got em yo give them to family. This isn’t the first time that I have written about shopping bags as a way to get a store mentioned in user-generated posts in social media. In fact, it was about two years ago that I wrote a post explaining how to use visually appealing luxury shopping bags as photo props to get included in the posts when customers upload photos of their in-store purchases after a long day of shopping. In this case, though, the shopping bag was not only used to carry home the products purchased, it was the product. A product that was the star of a lot of photos posted online shortly after the bags went on sale. Because the sale of the bag helped the Selena Foundation while honoring the beloved singer, I think H-E-B did almost everything right. 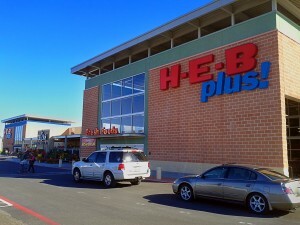 I say H-E-B did almost everything right, because the website did go down and they did run out of bags on the first day. Clearly there was more demand than the store anticipated. And, if the website hadn’t crashed, would the press have covered it? Who knows? Therefore, that might be a good thing, as well. As I have said before, offering customers a trendy shopping bag is a great way for retailers to get included in the post-purchase photos that customers upload to social networking sites after a long day of shopping. As highlighted in this post, H-E-B offered a limited edition reusable shopping bag that honored a beloved singer and benefited the Selena Foundation. In this case, the bag was the product. A product that a lot of customers wanted, as demonstrated by the long lines and the many posts on social networking sites from customers bragging that they got the bag or complaining that they weren’t able to purchase one. Either way, the reusable shopping bag honoring Selena Quintanilla generated a lot of earned media for the store. And, that is a good thing. On that note, I want to end the post with a YouTube video from a customer who just missed out on getting the bag. He was gracious even though he waited in line only to leave empty handed… twice! (He waited in line in the store and couldn’t get a bag online before the website crashed.) Hopefully, he will still be able to purchase the bag online on eBay. Video credit: Aaron Sanchez on YouTube. Social networking sites have been around for over two decades. 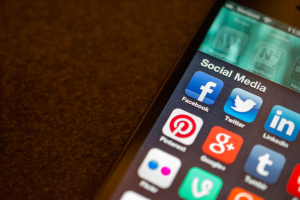 However, it wasn’t until recently that many businesses realized that social media was a viable way to get the word out about their products or services and maybe even a place to sell directly to the consumer. That doesn’t mean that these social networking sites weren’t trying to find ways to get businesses to use their sites to sell products early on, it was just that many businesses were slow to catch on. While many social media platforms rely on advertising that ultimately drives users to advertisers’ websites, many of the most popular social networking sites have at least experimented with ways to get consumers to buy directly from businesses without even having to be redirected to another website. To illustrate this, an infographic created by 16best.net has some interesting facts about social networks as ecommerce gateways. The part of the infographic that lists a “Timeline of Social Commerce” is shown below. Although not all inclusive, it highlights some of important points in the brief history of what people often refer to as social commerce. It appears that this is what 16best.net is using as the working definition of social commerce in their infographic. However, I need to point out that others have a much broader definition of social commerce. If you are interested, Wikipedia.org has additional information on social commerce and its other definitions. As shown in the infographic provided by 16best.net, many of the most used social networking sites are constantly looking for ways to help businesses convert sales directly on their sites without redirecting users to another website. This is good for the businesses selling the products because it reduces the number of steps needed to make a conversion, thus eliminating some of the lost sales that might otherwise occur because of website friction. It is also great for the social network because it adds value to their service, not to mention the fact that it keeps the user on their site. That said, from a business standpoint, it is important to keep up with the options available so that you can reach your customers where they are when they need your product. Again, your business might experience increases in sales by taking advantage of the social commerce options available, because there are fewer chances to lose the customer in the conversion process. In the retail environment, it is common to see a mirror or two located near items that are for sale. However, the reason for the location of these mirrors might not be as obvious as you might expect. 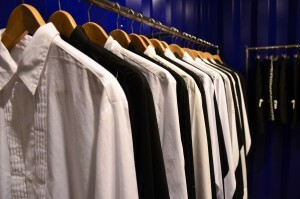 Having a mirror handy will help customers visualize whether or not an item goes with another item or even if the clothes that they try on fit in all the important places. 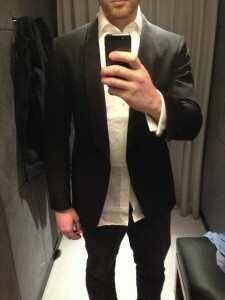 However, mirrors also serve several other important functions in retail. The research indicates that seeing their image causes people to think about their behavior and ultimately behave in a more socially desirable way. In fact, influence and persuasion expert Dr. Robert Cialdini suggests that mirrors could be an inexpensive way to cut shoplifting and employee theft. Paco Underhill, founder and CEO of Envirosell, also points out that mirrors are very important selling tools for retailers. 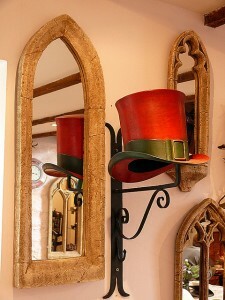 Mirrors are important sales tools for retailers. Not only do they help people visualize how an item will look on them before they make the purchase, but strategically placed mirrors might also be an effective way to reduce theft by shoppers and employees, alike. Furthermore, people slow down when they see a reflective surface. Therefore, mirrors can be used by retailers to help call attention to items that are located nearby. Finally, while many stores don’t provide customers with enough mirrors, providing too many mirrors can also be a problem. This is something to think about the next time that you are walking through a department store and see your reflection in a strategically placed mirror. Photo credit: Mara 1 on Flickr. Note: This post was originally published on HubPages in September of 2012. I removed it from HubPages in November of 2016.